Declan Gaffney finds it possible to "agree with Nick"... well, almost - there may be some agreement over Lib Dem opposition to George Osborne's regressive benefit cap. The Financial Times reports dissent within the coalition over the cap on benefits announced by George Osborne at last year’s Conservative party conference. Nick Clegg is said to be concerned that the policy “could have a heavy impact on large families, particularly those living in expensive areas such as London”. It’s a while since Left Foot Forward has been able to say ‘we agree with Nick’, but in this case he is almost right. The benefit cap is designed to penalise families with large numbers of children, because it is primarily child benefit and child tax credits which push the out-of-work incomes of some families up to and above the £500 a week at which benefits would be capped under the coalition’s welfare reform bill. Eighty per cent of the 50,000 affected households have three or more children, facing average losses of £95 a week. Clegg is only almost right because high housing costs are not the main driver of the arbitrary effects of the cap – see below. Given that the estimated savings from this policy are minimal (£240 million a year) it might seem that the cap is an obvious candidate for a post-referendum concession to the Lib Dems from Mr Osborne. It is hard to see the chancellor willingly conceding a policy which resonates so strongly with public perceptions about welfare that even the opposition has held back from querying its rationale. The popularity of the benefit cap arises from a basic misunderstanding which has been deliberately fostered by coalition ministers: that families on out of work benefits can have higher incomes than comparable working families. The key word, of course, is ‘comparable’, and comparability is what the DWP’s statement is carefully crafted to evade by comparing the incomes of certain types of family while out of work with the average earnings of working households of whatever size and composition. In fact it is virtually impossible for a household in which someone is working more than 16 hours a week to have a lower income than a similar out of work household with the same housing costs. Benefits and tax credits are designed to avoid this happening. The exception, which coalition ministers have quite deceptively used to plant the idea that people are better off on benefits than in work, is where people are working less than 16 hours, as Working Tax Credit was designed to avoid incentivising working only a few hours. But for those working more than 16 hours, incomes are unambiguously higher in work. The table below uses the DWP’s own tax/benefit model to exemplify this for the sort of large households who will be most affected by the benefit cap: couple and lone parent families are £63- £118 a week better off in work working for 16 hours at modest hourly wages. The table also shows the amounts of in-work benefits these families can receive, which are comfortably higher than the cap over this range of hourly earnings. In the exemplification above, private sector rents of £209 a week are assumed but families with very low rents can still fall foul of the benefits cap if they have four or more children, as can be seen from the fact that an estimated 80% of the families affected are in social housing. This is because child benefit and child tax credit make the main contribution to pushing incomes above the cap. For a couple with five children, these entitlements, combined with income support for the parents, sum to £435.75 a week. That means that in order to remain below the £500 a week cap, this seven-person household would need to be spending no more that £64.25 a week on rent and council tax. It is hard to imagine a more arbitrary basis on which benefit entitlements could be limited. So as long as we don’t compare apples and pears – that is as long as we compare incomes with incomes, not incomes with earnings, and only compare incomes for households which are actually comparable – the premise on which the benefit cap has been sold is thoroughly fraudulent. Thanks to tax credits and the minimum wage, there are very few circumstances under which households don’t see a serious gain in income from moving from worklessness into work: comparable households are not better off on benefits. When Nick Clegg’s spokesperson tells the FT that welfare reform was “a challenge that Labour ducked spectacularly”, they show not only startling ignorance of what actually happened under Labour but the Lib Dems’ inability to say anything about welfare reform without leaning on a narrative of Labour failure. Lib Dem concerns about the cap sit uneasily with their cheerful endorsement of the arguments underlying the policy – that benefit expenditure was ‘out of control’ under Labour , that this was due to large numbers of families having disproportionate entitlements and being better off on benefits than working and that this is ‘unfair to taxpayers’. It is not until Lib Dems start challenging these claims that their critical stance will merit more than one and half cheers. Hope you get that into the Labour manifesto, “Vote Labour and we’ll pay more in benefits to some than most of you earn”. Winner. [email protected] @leftfootfwd: 1.5 cheers for #LibDem opposition to benefit cap http://bit.ly/ktKrFe <- £26k is more than twice min wage! This is why we will always need spin doctors. The Tories are masters of this sort of stuff: turn the working poor against the non-working poor in order to keep benefits down for the poor in general. Genius. As I said, the key word is ‘comparable’: look at the Income Before and After Housing Costs lines in the table, which shows how much better off working families are even on low earnings. 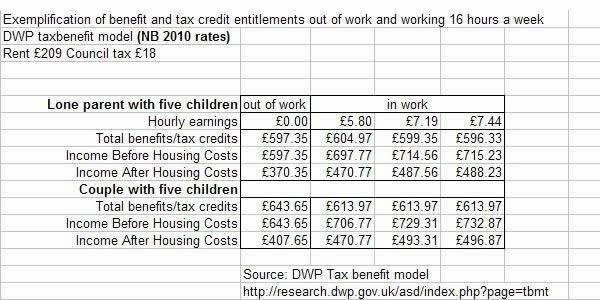 Then look at the benefits/tax credit lines, showing how much the working and workless households are entitled to. We have an integrated system of support for children in out-of-work and in-work families, which is what drives these figures and which the coalition supports. But they seem to think they can boast about raising child tax credit entitlements while treating the mechanical effects of this on the incomes of larger out-of-work families as some kind of scandal. Declan, I don’t suppose you have the figures to do a like-for-like comparison between the incomes (including benefits & tax credits) of a large family on out-of-work benefits, and a comparable working family on ‘the average weekly wage’? That would be interesting, given that the Coalition single out families on the average wage as their benchmark. It would show exactly how much it distorts things to compare “the *incomes* of certain types of family while out of work with the average *earnings* of working households”. I echo Guido’s point completely. The part of the article which stood out for me was the following quotation: the policy ‘is extremely popular with the public’. Bullseye. I’ve been saying it for ages on this site and will continue to do so. It’s good fun to see that the Lib Dems’ toys are being thrown out of the pram over this issue. I thought they might have chosen their battles a little more wisely. They can join Labour on the wrong side of the argument and lose votes over it, fine by me. The one reform in which I’m most interested is housing benefit (partly because we hear so little about it, whereas the NHS dominates the news agenda). I want the government to hold its nerve and consign this unjust situation to the dustbin of history, and I’m certainly not alone in that. Ash: Sure. If a lone parent in the same circumstances as in the article (5 kids,£209 rent) was earning £500, income after housing costs would be £518,before housing costs £745, compared to £370 and £597 respectively out of work. In this case, income after housing costs for the working household is almost the same as earnings, but as long as comparisons are like for like, i.e. either taking account of housing costs or ignoring them for both households, the working family is obviously better off. The household would be receiving £363 in tax credits, child benefit and housing benefit, which almost matches liability for income tax and NICs: however these figures are based on 2010 rates (DWP model hasn’t been updated yet) so tax probably overstated and CTC definitely understated. Couples would have incomes of £526 AHC and £763 BHC. Any suggestions as to how to spin all of this into an easily communicated message? My immediate thought re ‘spinning’ this into an easily communicated message would be this: for as long as you accept that the onus is on you to unpick the Tories’ claims about ‘wages’ and ‘incomes’, explaining why it’s not as simple as just comparing the wages of a working family with the income of a family on out-of-work benefits, you are going to be on the back foot. So ignore the subtleties and just announce, loudly, that anyone who implies that a family on out-of-work benefits can be on a higher income than a comparable family on ‘the average weekly wage’ is a liar. 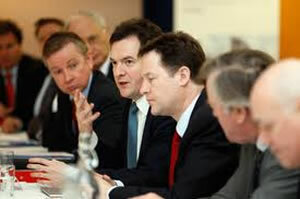 The onus is then on the Tories to do all the tricky explaining; they have to explain that they never meant to compare the overall incomes of non-working families with the overall incomes of comparable working families, but rather the overall incomes of non-working families with one part of the incomes of comparable working families (their earnings from work). And they have to explain why on earth that comparison is supposed to be relevant.